Cyberpunk 2077 has a “full destruction system.” A hands-off press demo at E3 2018 revealed that the game will have a destruction system that will likely have a strong tie to one of the game’s weapon classes. Between Cyberpunk, Fallout, and now even The Elder Scrolls VI, there is plenty of competition for our list of the best RPGs. That job title (via SegmentNext) suggested as long ago as last summer that there would be destruction in the upcoming sci-fi RPG, but this is the first official confirmation from CDPR. 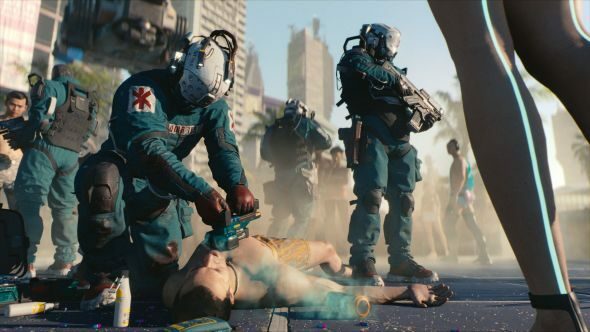 It had already been hinted at at E3 though, as Cyberpunk 2077’s weapons include a ‘tech’ class that can shoot through walls (as well as NPCs who don’t get out of the way in time). We don’t know the Cyberpunk 2077 release date just yet – I don’t imagine we’ll see it until the second half of 2019, but we should learn more from CDPR at some point soon.